Get ready for a whole load of fun with this Dump Truck Pinata. Designed to look just like the real heavy duty vehicle, this construction truck Pinata is sure to be a hit with little builders at any kid’s construction birthday party. 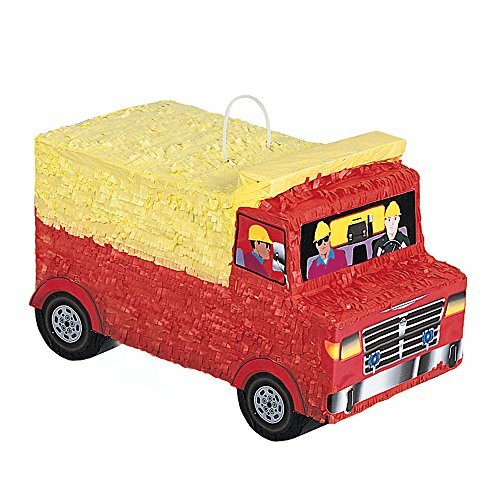 To get the fun started, fill this Pinata dump truck Pinata up with 2lbs of candy and fun favors (Pinata filler not included). Then, attach it to the ceiling, or to a sturdy tree branch outside before having kids line up and take turns hitting it with a bat or a stick to try and break it open. Not only a fun party activity, this dump truck Pinata will make a super cool party decoration, too.